The MK319 case and grille design are new, designed to cut down the sound refractions inside the grill, allowing a smoother and more open sound. The pad and HPF switches are improved on the MK-319. Internal wiring runs are longer than on the MK-219. 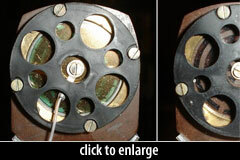 The diaphragm is gold sputtered teflon, mounted to a center-terminated capsule design. The rear diaphragm is not sputtered. Both sides of the capsule are covered by a resonator disk — a passive acoustic equalizer device that contours the capsule’s frequency response. The mic exhibits a presence rise intended to give warmth and clarity to the human voice. Scott Dorsey’s June, 2005 article on modding the MK-219 and MK-319, published originally in Recording Magazine, has recently been republished online. See the link in the sidebar. 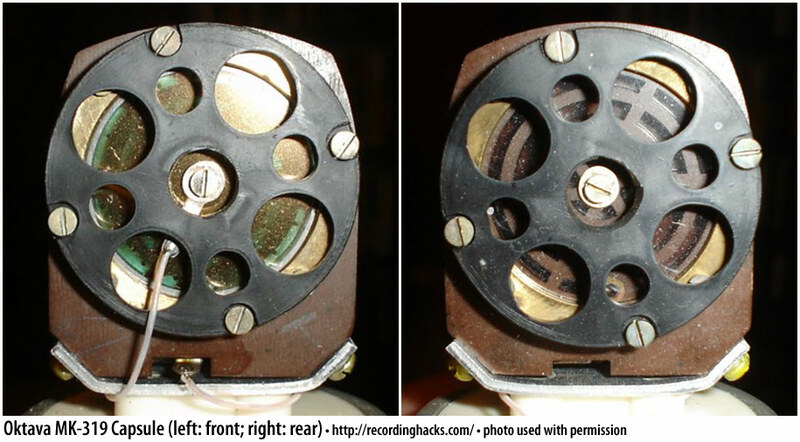 Prior to the Recording Magazine article, the HomeRecording forum was host to an extensive exchange about modding the MK-319, with information on the HF resonance discs, damping body ring, replacing components, and so on. The Oktava MK-319 is also known as: 319, MK319.